o, how are other people using their Applications folder? Maybe this isn't even an issue for you, but the idea of just tossing programs in that folder without any substructure is just nuts to me. It's more trouble, for me anyway, to use an application launcher than to simply keep the Applications folder organized. The first thing I do on a fresh install of OS X, is to drag the icon for the App folder into the dock and quickly sort out the built-in programs, as in the first screenshot here. It's very quick (Spotlight searches take twice as long, but are always available also) and it's using nothing beyond standard Finder features. But enough about me, I'm wondering how others organize their folder, or if you're happy just pushing all new programs in there without thinking about it. Ok, so I don't usually suggest this folder set-up to others when I help them with their machines, but that's what I'm curious about. Does anyone else do this kind of organizing, and if so, how so? I throw 100% of my apps into the top level of Applications, and never launch them with Finder ever again, and it makes me cringe that Apple has a Utilities subfolder. Then I launch everything with Launchbar. "It's more trouble, for me anyway, to use an application launcher than to simply keep the Applications folder organized." I often don't know the name of a program I'm about to use. I'm looking for a type of program, often not a specific app. (My most often used apps are in the Dock, generally.) For instance, how would I glance at just the icon editing tools with LB (not trying to single-out LB here)? I should mention that even with the greatest application launcher it probably wouldn't affect how I store stuff in /Applications, since I want to be able to group programs by type. This is really the whole point for me. I have hundreds of programs on my machines. I can't remember what most of them do just by looking at the name or icon. 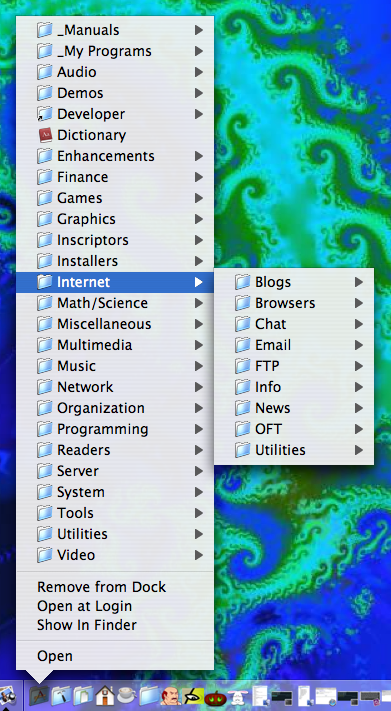 The folder groupings gives me most of the info I need to pick a tool for a task from a group of tools. I believe the only way an application launcher could help me with this chore would be to group them within the scheme of that program, which ends up being the same task just done on another level. One advantage of doing it in folders is that these groupings are independent of what application launcher I happen to use, and another is that others making use of my applications directory on another account on this machine (or on my network) need not ask me what all these programs are. It's all fairly self-explanatory this way. This reasonable? I can be swayed if a good case for flat storage is made, and who knows, Leopard may provide that argument in a few days. Just as a follow-up, nothing in Leopard substantially changed on this front. I remain (happily) organizing my /Applications folder. While I also organize my Applications folder, I use ~/Applications instead of /Applications for that and just use aliases for the apps that *have* to go into /Applications. The reason is that most of the original Apple apps have problems when an update tries to update them and they are not in /Applications. Makes also backups somewhat easier. I just bung it all in the top level and use Quicksilver to launch. I don't have so many apps that i forget their use just yet. As I acquire engineering/maths tools I might find a need to seperate those off though. I organize as you do. It is sometimes annoying with updates and dictionary as you pointed out. I hope Apple fixes those bugs because I find the idea of an app-launcher redundant. and then set the text color to a light grey so it usually shows up whatever the desktop image may be and use a small unobtrusive font and route it to a secondary monitor. Remember too, QuickSilver can facilitate the association of metadata tags with you files. Sorry. I should of mentioned where 'gsort' and 'gpr' come from. They are part of the GNU Coreutils and in my case I got it via Fink. This collection of Unix tools are *tremendous* time savers if you do much Bash scripting. As memory serves me you have the option of dropping the leading 'g' but I am sure the reader can imagine the confusion that would cause when readers of the post in question tried to use the script with command options that their version of 'sort' or 'pr' did not support yet. Very interesting stuff, Perry. I'll have to play with these suggestions. If I can create meaningful content with it, then it deserves a place in /Applications, if it is some tool then I move it into Utilities, unless it is a game and then it goes to /Games. If I intent to drop files on it I put it in the dock. The /Applications is always sorted and shown as icons that fit in one window. I have been looking all over for advice on how to organize my applications. I have to have a separate folder for my third-party applications, because I have so many. Do you think you can help categorize my applications?